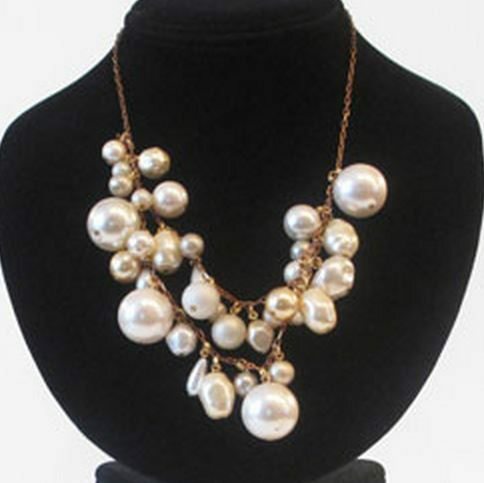 Traditional style guidance has said that large jewelry is not flattering to, or elegant on, small women. But opinions about beauty, diversity, and body type have evolved. 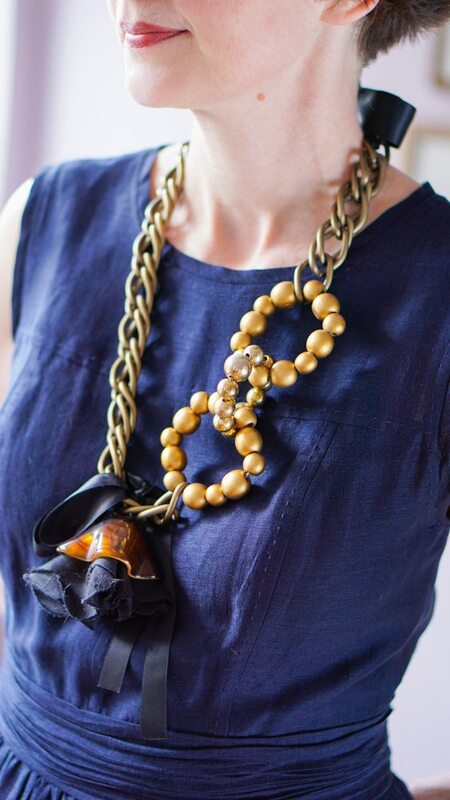 Statement Necklaces have been ubiquitous for the last five years and everyone gets to wear them, including me! This PVC necklace was completely irresistible — to me, at least. It was more elaborate when I bought it, but I removed two of the dangling elements for a restrained look. So please note the restraint. 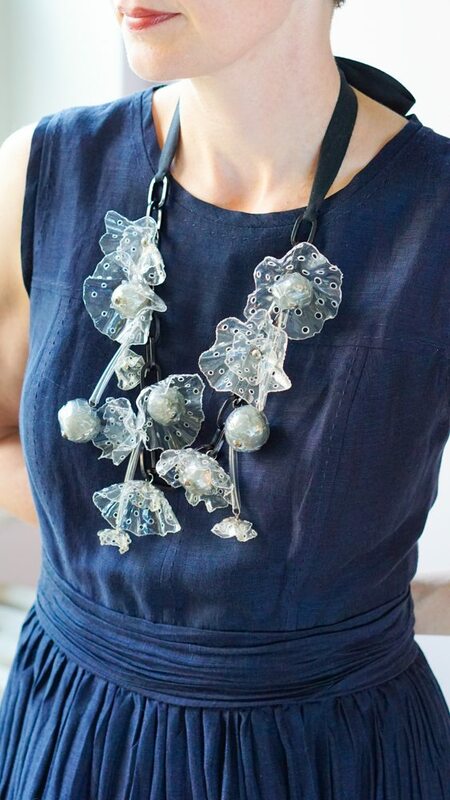 I don’t know if there are any bright-line rules about when you should wear your transparent plastic jewels, but this necklace seems very summery to me. Don’t worry, it has a cool weather sister. Even I must concede that the mixed metal necklace is truly haphazard. 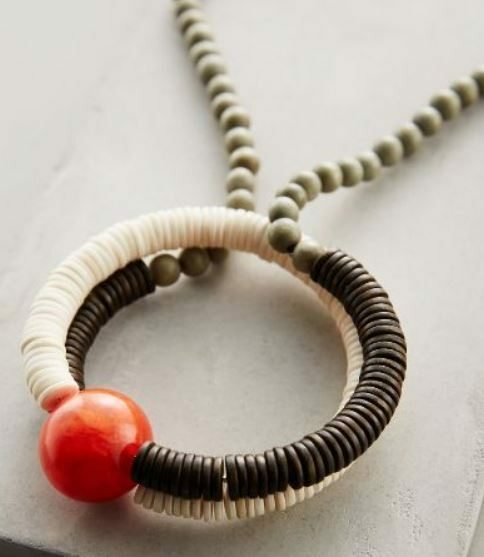 The first time I wore it, my husband thought — in his words – that it was “some random crap you picked up around the house and strung around your neck to make me laugh.” Non, mon ami. No one here is laughing. 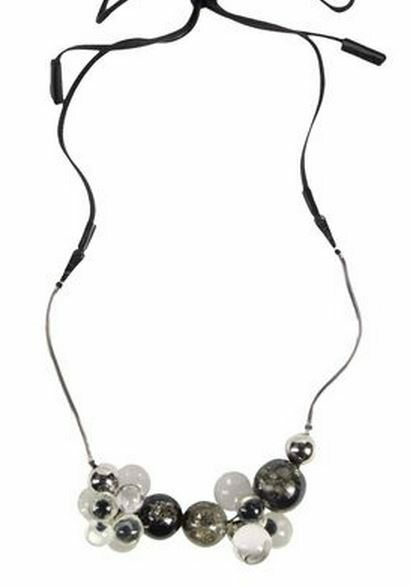 A word of warning about necklaces like these: Don’t wear them when you expect to be hugging a lot of people. It is actually quite painful to be bear-hugged when you are wearing a necklace made of rigid material that is truly occupying three dimensions — so no family reunions, no Christmas parties. But there’s no hugging at work, so off we go! 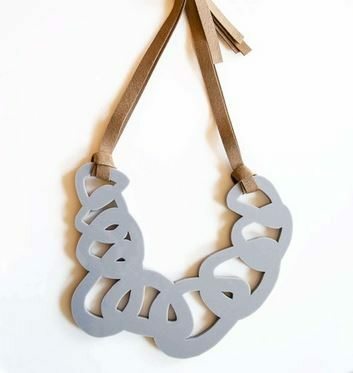 I love the crazy necklaces! To think I knew The Directrice back when she declined to wear even the tiniest of necklaces. This just goes to show that people CAN change. 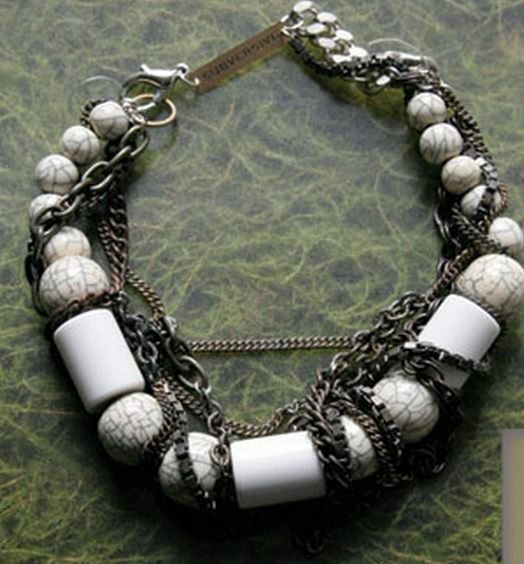 As husband, I must attest that I really was befuddled by the winter-wear necklace. I had never seen anything like it. But that’s my wife: even after five years of marriage she still surprises me. All the time. I have to tell you how much I enjoy the way you write. Such a great humour. Love those fabulous necklaces. They work so well with a simple dress. Thank you for visiting! I am so glad that you are enjoying the blog. This is the funniest post. I just love it! I am going to wear a big necklace tomorrow. Maybe Wednesday, if not tomorrow. I have purchased a few over the past several weeks, but am yet to wear any of them. I don’t know why I have been purchasing them. They are compelling to me lately for some reason. Hmmm. One has lots of fuchsia pink plastic pieces which look like cellophane. I’m sure my husband will be quite challenged. I’m nonplussed! And after checking your endnote (I’m a lawyer, too, so I can’t help myself), I’m not sure what that means! I think I’m with your husband on this one — but then again, the necklace looks stunning on you.